The American Gem trade Association has announced their winners for the 2009 Spectrum Awards. The AGTA Spectrum Awards are widely considered to be the most respected and prestigious creative award in the jewelry design industry. This was the 25th anniversary of the awards. 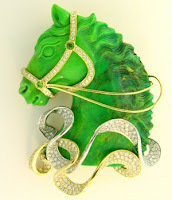 The piece in this picture is the best of show, "Enchanted Stallion" brooch, featuring a handcarved turquoise with diamonds, demantoid garnets and 18K gold. To see a complete list of winners and pictures of some fabulous jewelry and gemstones go to the JCKonline Website.